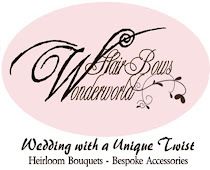 So, in the past years I'd been working hard to provide a wide range of products to my brides. I am pretty chuffed about what I've achieved so far I decided to blog about it :) This first part is all about bouquets, which I am able to offer my customers. As the tittle said itself - a little bit of everything! Well, except fresh flowers :) but these look fresh just as real flower isn't it right? 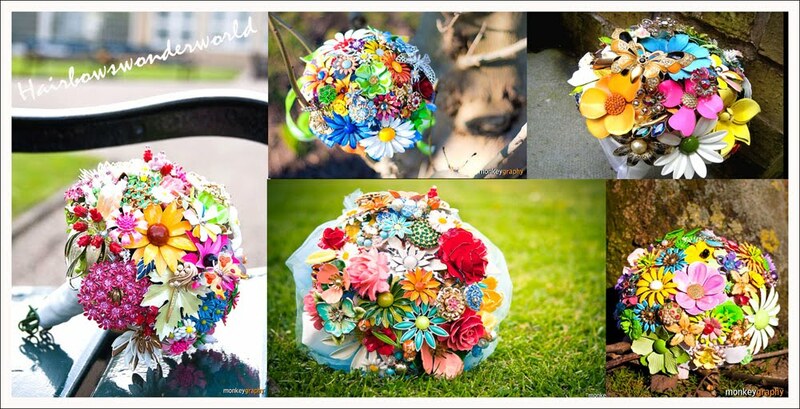 These "bold & bright" flower brooch bouquet pictured below are what I've made for my vintage loving brides. All are sold including my bouquet serie "Garden of Happiness" but I am very glad to announce that Garden of Happiness 4 and Garden of Happiness 5 are going to be released soon! 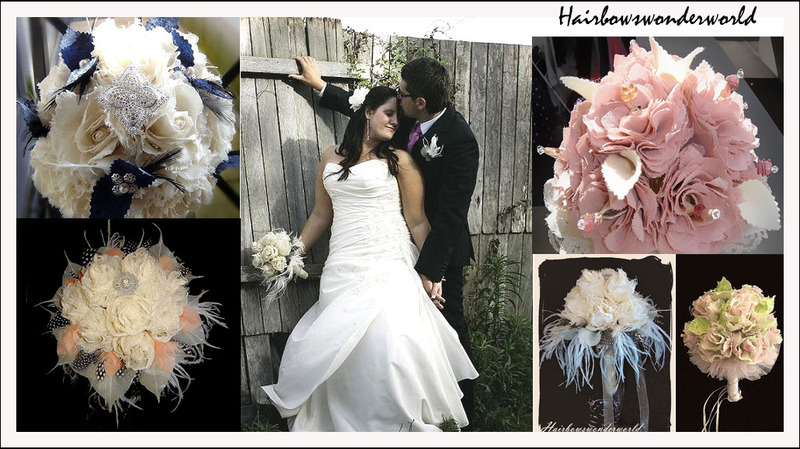 I used vintage brooches and earrings in these bouquets, but not just everything or any kind of brooches. I used mostly enamel flowers and rhinestone brooches with flower shapes with bright, cheerful colours and some quality glass lampwork flowers or czech glass flowers as fillers. Each bouquet has its own unique backing. 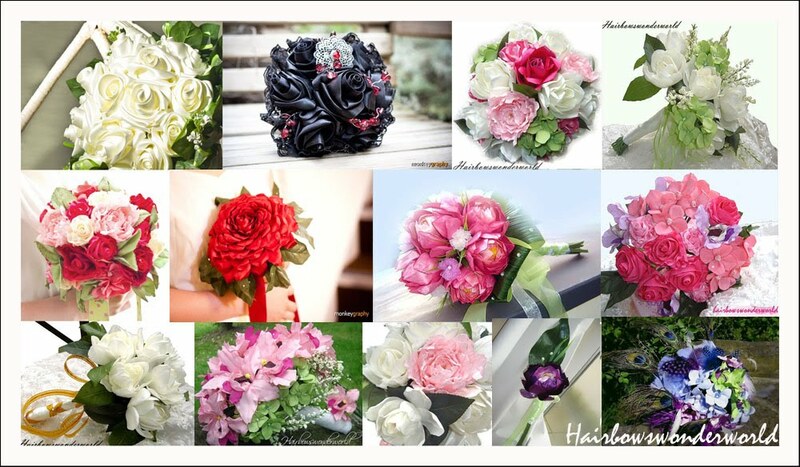 If you like that type of bouquets pleasee feel free to visit my shop. If you don't see anything like these listed (meant sold out!) just convo me for a possible custom order! Below are another type of brooch bouquets which are focussed more on a certain theme, or colour scheme. 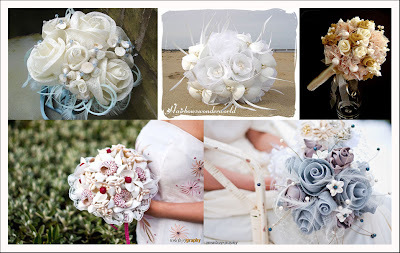 These bouquets (in the next picture) are made with either seashells or sinamay, or both! I also used pearls, feathers, silk and lace for more variety and texture. If you have any other material that you want to use, simply let me know and I bet we can work things out together. You design and I'll make it! I will be more than happy, trying to bring your vision to life! This Shabby Chic style is my best seller so far. Fabric flowers, cut, frayed and shaped by hands are arranged into bouquet together with either pearls, lace or feathers. So vintage, so whimsical! I also carry a wild range of fabric flower bouquet in my shop. 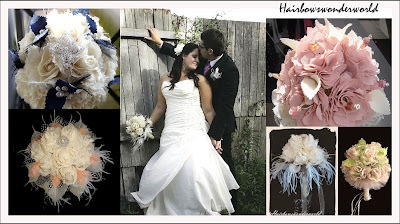 Either a type of life-like handmade fabric flower bouquet, or a more abstract style, such as bouquets made of my signature rolled rosettes, the possibilities of colours and types of flowers used are endless. 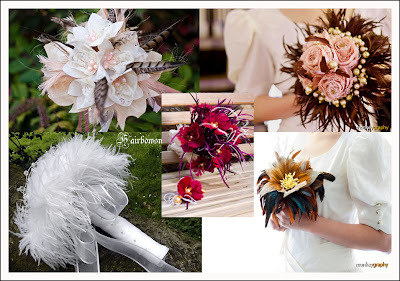 If you want something luxury, unique , light and floating, there are feather bouquets. You can have it custom made in many different colour schemes and different sizes and shapes. Last but not least are my ribbon flower bouquets including some of my very unique designs such as Lotus, Orchid, Peony and Gardenia. These bouquets require very precise work and technique, a lot of time and patience. But in the end there will be something beautiful. It's actually very hard to divide those bouquets into groups as I've done above. 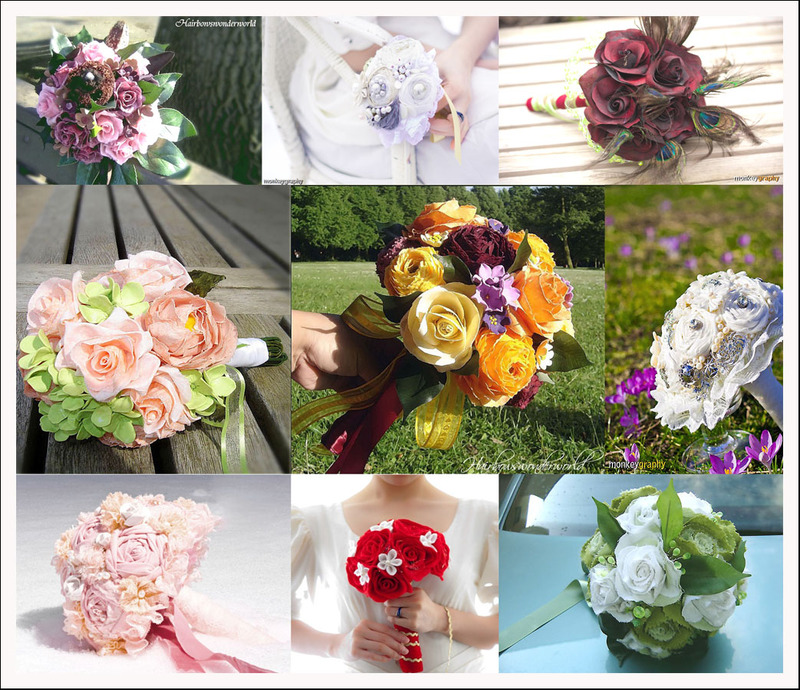 There are bouquets which have a little bit of everything and indeed a combination of two or more styles listed above. I am still exploring and hope I can introduce some new types this autumn. If you like what you see here, please check back my blog once in a while for PART 2 : Hair Accessories. Wishing everyone a bright and happy weekend! Thank you so much, Hello Gorgeous! I love making those and hope to expand the range of flowers.